With over 30 years of experience working closely with Pilates studios, health and fitness clubs, and wellness and rehabilitation centers, Balanced Body has become a valuable resource for any Pilates professional. From marketing tips to floor space management and budgeting, we have the tools and know-how to help you create a successful Pilates program. Find helpful marketing and equipment information for Pilates studio owners and instructors. Get Pilates resources for commercial fitness club owners, directors, managers and instructors. Learn why Pilates training has become an essential strength and conditioning tool for the world’s top athletes and sports teams. 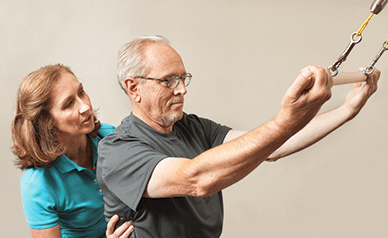 Learn more about how physical therapists and wellness centers are incorporating Pilates as a valuable and profitable addition to their practices. This page tells you what upcoming conferences and tradeshows we'll be attending. You can also find great deals on the equipment we bring to these events, and request free tradeshow passes. Our job board connects Pilates professionals with current employment opportunities. You can post an opening or search current listings.